Would you like 8 tips for hosting an easy little party at home this summer? Hello everyone! This is Anke, I'm on cattledogs once monthly with my entertaining column and today I have a very romantic tabletop story for you. But first, how are you? Did summer arrive where you live? Here in Germany it has, and the blooming flowers overwhelm as does the lush green everywhere. I also love the long, light evenings -- they are definitely more than welcome. Today I have a romantic, floral tabletop story to inspire you for a summer gathering at your home indoors or out on the terrace. Let's follow nature as a good example and not hold back on color and light! This is more or less the motto for all of my columns, but this time each year I sorta flip out even more with pastels such as pink and peach when decorating. And I know you are out there, pastel-lovers! 1// CHOOSE YOUR FLOWER. The peony is probably my favorite flower. What is yours? I can't pass by them when I spot the splendid bunches at the flower shops and the weekly markets in town. For this story, I've let them team up with sumptuous field-grown roses. 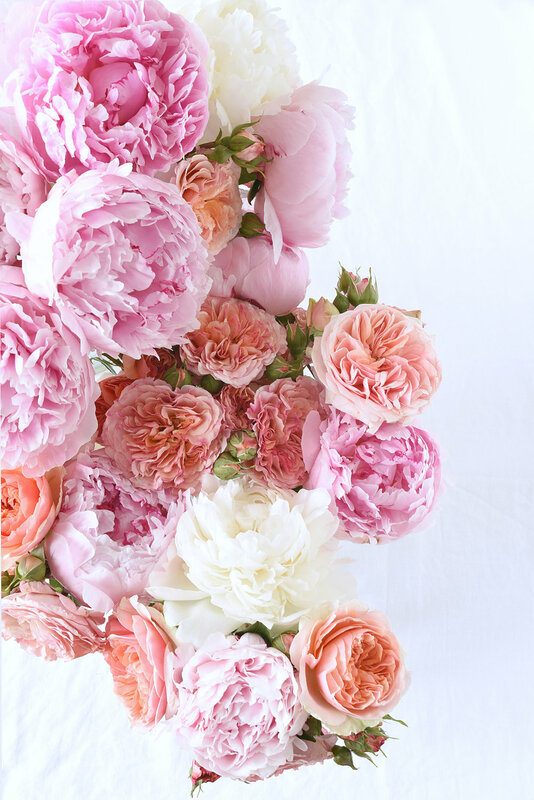 Together peonies and roses are masterpieces made by nature, don't you think? Select your flowers or greenery for the party and let them guide your theme. This can be your first choice of inspiration or something you do in the middle or end of your shopping. In this story, the flowers inspired everything else. Some people begin with the food they will serve or the pattern on their dinnerware. It's up to you. 3// ADD A GARLAND. Nothing says party time quite like a garland (or you may call it bunting?). One more detail made of silk paper I chose was the garland you see in the background. Garlands are such a perfect adornment for a summer celebration. They make everything festive. You can buy them pre-made or make your own. You can also embellish pre-made garlands by adding balloons and ribbons for a little personalization. 4// DRESS THE TABLE. A simple tablecloth and napkins made of white linen were added along with very plain white tableware. I placed arrangements in simple glass canning jars and a single large glass vase to keep it light and bright. I didn't add ribbons or anything else, I figured the roses were enough and I didn't want the theme to get too girly. I liked the simple glass because it reflects natural light so well and visually the flowers become the focus, not the vessels. 5// MAKE PLACE CARDS. Instead of traditional place cards I tied tiny golden frames onto napkins using jute cord and embellished each one with a paper blossom. I printed out the little tags on my computer using a favorite font. 6// HAVE A SIGNATURE PARTY DRINK. I offered Rosé Secco poured into simple glasses filled with ice cubes, peach slices and fresh mint. Every gathering, no matter how simple, needs a signature drink - alcoholic or not. What do you like to serve? Gin tonic with slices or cucumber and mint are nice for summertime, too. "Cheers to summer!" 7// ADD SIMPLE PARTY DECORATION. A small party can still feel festive! If you have an extra 30 minutes, print out some words in color and frame them for your wall in the space. If you are good at hand lettering, use your favorite color marker or paint and paint some words - Happy Birthday, Welcome Summer, It's a Boy!, or anything else that fits your theme. 8// PLAN YOUR PARTY MENU. What will you serve? Food is key to making a party (or breaking it!). For this little gathering, serve a roasted chicken dish with roasted veggies or maybe some pasta or a salad dish -- something very summery and fresh. You can also opt for a simple spread, like a cheese and meat board with fresh bread and toppings, buffet style. Another idea is for a casual afternoon cake and coffee party only without cake and no coffee - go very light. You could plan this for after work on a Friday with the girls before a long weekend or on a Sunday afternoon. For my setting, I served one of my favorite summer desserts which is oven roasted peaches with Greek yoghurt, topped with crushed Cantuccini (Biscotti), pistachios and fresh mint. So simple and so good! Drizzled honey on top is also a good idea with some orange zests. My kids prefer vanilla ice cream, it's your choice. I'd like to wish all of you many beautiful, sunny, memorable and relaxed summer moments (filled with a party or two) in the upcoming weeks! If you have some nice parties this summer and want to share them with cattledogs readers, post your tabletop on Instagram and use hashtags #cattledogs #decorateforaparty so we can see what you've done. We'd love to see and if we have some nice submissions, we can feature our favorites on cattledogs! I'm looking forward to returning with my late summer column after I return from our summer vacation, so expect to see me here again in early August with another tabletop idea for end of summer. - .